By now, you probably know where you will be for Christmas dinner, what you’ll be having, and who will join you around the table. Cooking the classic Christmas dinner in an RV may be a piece of cake (pardon the pun) for the veteran RVer, but for the seasonal traveler or RV newbie, figuring out how to fit a huge turkey into a small finicky oven can be a challenge. The solution is to keep it simple or better yet, get together with your neighbors for a potluck dinner where every RV is responsible for just one dish. Plan the menu so that you can prepare some dishes ahead. Casseroles, mashed potatoes, squash dishes actually taste better when made in advance. So do many pies! Save the ham or turkey for Christmas day roasting, preferably on an outside grill. And because counter space is lacking, remember the mantra: less is more and simple is better. You may not even need an oven for much more than warming if you cook most of it on the grill or in an outdoor dutch oven. Think “roasted veggies and grilled stuffing.” Yum! Crock-pots take up relatively little space and do a great job of making cranberry sauce and keeping those made-in-advance mashed potatoes warm until dinner time. If having Christmas dinner in your RV or RV park is too much to handle, there are some nationally owned restaurants that are open Christmas Day. The owners of our locally-owned and famous Hobe Sound restaurants like Taste, Scooters, Catfish House, Harry and the Natives, Courtyard Grille or Prime will be shuttered, so head out for a no-mess no-fuss meal at Denny’s, Waffle House, McDonalds, and possibly Golden Corral. Here’s the list. 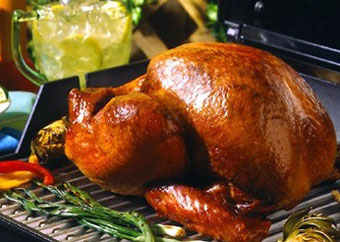 For instructions on how to prepare your Christmas turkey on the grill, check out Butterball.